Mike Krzyzewski has one of the best Duke teams he’s put together during his impressive career but he also spoke highly of the program Mike Brey has built at Notre Dame. 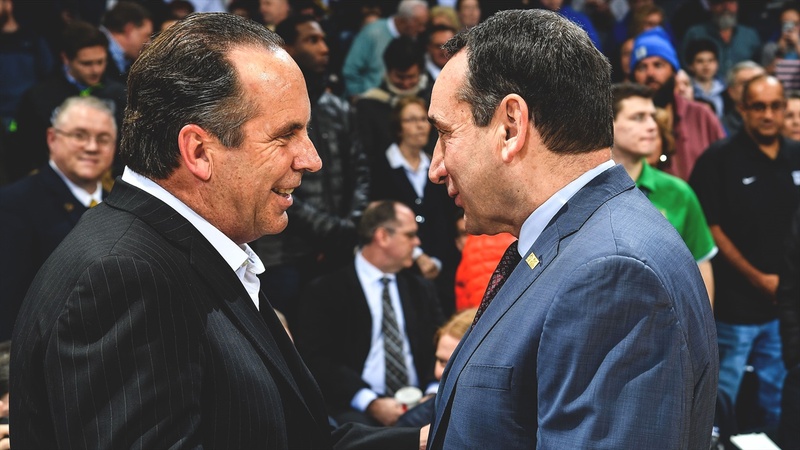 While the Irish and Blue Devils might be headed in different directions this season, Krzyzewski was impressed with the effort from Brey’s squad during Duke’s 83-61 win at Purcell Pavilion. The relationship between Brey and Krzyzewski goes back years. In 1987, Krzyzewski hired Brey to be an assistant coach at Duke. Brey then left Duke in 1995 for Delaware. Krzyzewski didn’t hesitate to give credit to Brey for helping him build the culture and program at Duke during his eight years in Durham. Notre Dame is struggling this season and while no one will feel sorry for the Irish, Krzyzewski knows this season is an outlier for Brey’s program. What makes Notre Dame a great program? Krzyzewski would know as he has won five National Titles and 12 trips to the Final Four since taking over Duke in 1980. Krzyzewski isn’t worried about how Brey will deal with this season as he gave an example of the 2005-06 season where Notre Dame lost six games during the regular season by one possession. “I remember they lost all those close games,” said Krzyzewski. “It was nuts. I remember calling him during it and asking if I could talk him off the ledge. He said “I’m good.’ I told him I knew he would be. That was one of the more negative things that can happen to a team and they handled that. They grew from it and that’s one of the reasons they are so tough.